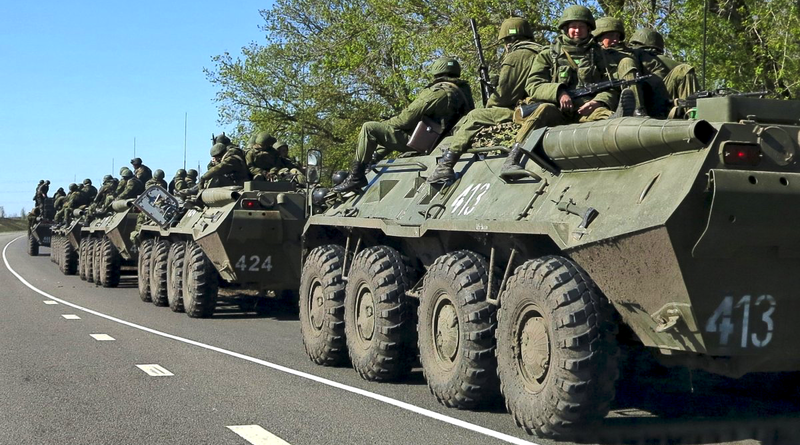 KIEV, Ukraine -- As the bloody standoff in Ukraine reaches its annual apex month for violence, Kiev claims Russia is sending more troops near its borders, while the Kremlin has snapped back that it has every right to do so. Russian servicemen drive armoured personnel carriers on the outskirts of the city of Belgorod near the Russian-Ukrainian border, April 25, 2014. Relations between both countries have deteriorated significantly since Russia annexed Crimea from Ukraine in 2014; it has since backed separatist militants in Ukraine’s border regions. However, Moscow has not officially declared war on Kiev and continues to deny official involvement in the fighting on the ground. Speaking during a military conference, captured in a Facebook video and posted on the military’s official account on Sunday, Ukrainian Chief of General Staff Viktor Muzhenko said his forces had observed new moves on the Russian side of the border. “The organizational and staff structure, the arms and the military equipment that is approaching for reinforcement, indicates that these Russian divisions are striking forces in their essence and are intended for carrying out rapid offensive actions,” he said. The units in question, Muzhenko specified, were three motorized rifle divisions, two of which are usually headquartered at the borders of Ukraine’s war-torn Donbass region and one that is usually deployed further north, near Smolensk. Russian troops have previously dug in near the Ukrainian border, including near separatist-held lands, at times of impending fighting. Observers regularly record peaks in cease-fire violations during August. Asked to confirm or deny any deployments closing in on the Ukrainian border, Kremlin spokesman Dmitry Peskov did neither. “The Russian Federation is free to change the configuration of armed forces on its territory in accordance with what it views as most purposeful,” he told state news agency Itar-Tass on Monday. Russia denies officially supporting the insurgents in Donbass but has not provided a detailed explanation as to where the fighters acquired the troops and equipment to hold one of Europe’s most numerous armies at bay for three years. During a phone call with the leaders of Russia, France and Germany, Ukraine’s President Petro Poroshenko warned on Monday that the past few days have been some of the “bloodiest” this year. Speaking to RFE, Kurt Volker, the newly appointed U.S. representative in Ukraine negotiations, said the conflict resembles a “hot war,” pointing out that a recent increase in clashes across the Donbass has killed at least nine Ukrainian soldiers within 72 hours.